A system making a recipient’s name as important as the bank account number and sort code when payments are made could be delayed by up to 18 months. The Confirmation of Payee system means anyone making a payment will be alerted if the name does not match the account. It is designed to prevent millions of pounds worth of fraud and regulators wanted it to start in July. But UK Finance, which represents banks, said the system would not be ready until “some time next year”. The Payment Systems Regulator, which will ultimately set the deadline, said it wanted the new rules to be in place as soon as possible, but only when they could be effective. At present, anyone making a payment adds the intended recipient’s name, but it is ignored by the bank. Only the account number and sort code need to match for the payment to be successful, so fraudsters pose as someone legitimate to trick victims into paying them money. 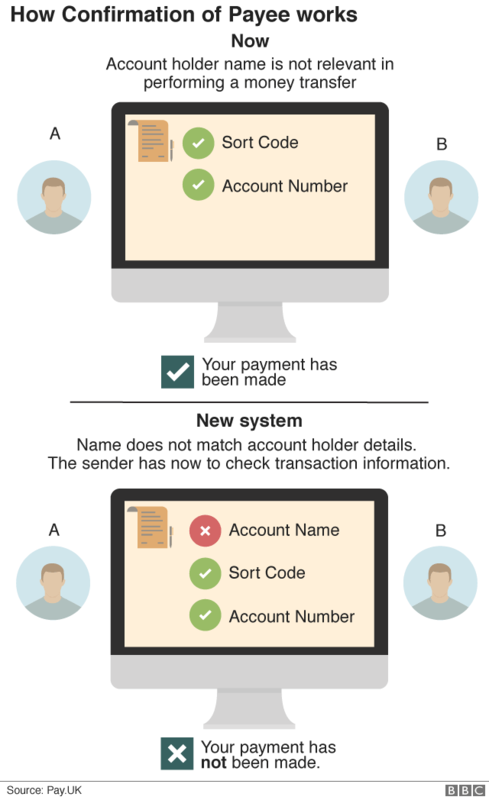 When setting up a new payment, or amending an existing one, banks will be able to check the name on the account of the person or organisation you are paying. If you enter the wrong name for the account holder, you will be told the details do not match and advised to contact the person or organisation you are trying to pay. The aim of Confirmation of Payee is to cut down on so-called authorised push payment (APP) scams, in which people are conned into sending money to another account. One APP victim was Angelene Bungay, of Shrewsbury, who was duped into paying £13,000 to someone posing as the builder carrying out her loft conversion. She was not refunded by her bank. Banks typically refund only about a fifth of the money that goes missing, pointing to legislation that says customers may be liable if they authorise the payment and are negligent. Hundreds of millions of pounds have been lost in this kind of scam, with some victims losing life-changing sums. During evidence to the Commons’ Treasury Committee, Stephen Jones, of UK Finance, said for the first time that it was the intention that victims would be reimbursed when neither the bank or the victim were to blame for the fraud. This could eventually be funded from insurance, although other options are being considered. He also said that Confirmation of Payee would not be ready by July, which was the regulator’s suggestion during consultation, but some time next year. He said it had not dropped down the list of banks’ priorities, but was a complex change in their IT and processing systems. “This is a big change at a time of a lot of change,” he told the committee. A spokesman for the regulator, the PSR, said: “We want to see Confirmation of Payee brought in as soon as possible and also make sure that when it is introduced, it is an effective way to stop this crime taking place. Consumer groups have previously accused banks of dragging their heels on introducing the system.